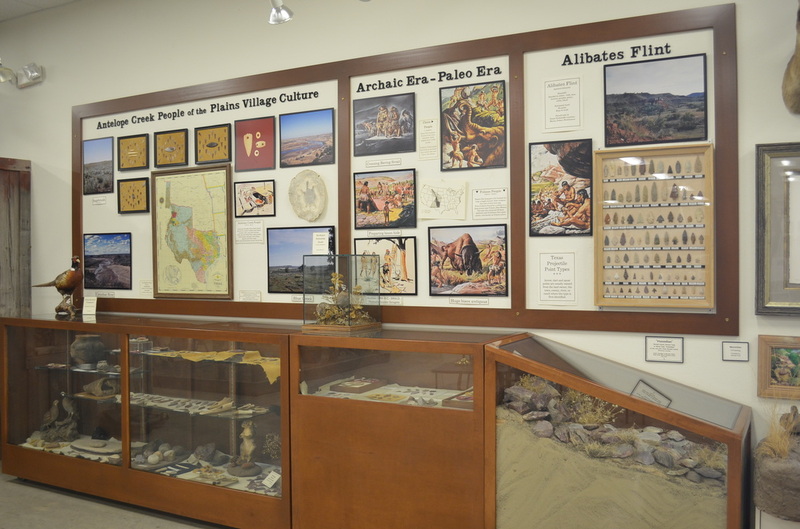 The images shown below are only a few examples of the exhibits. 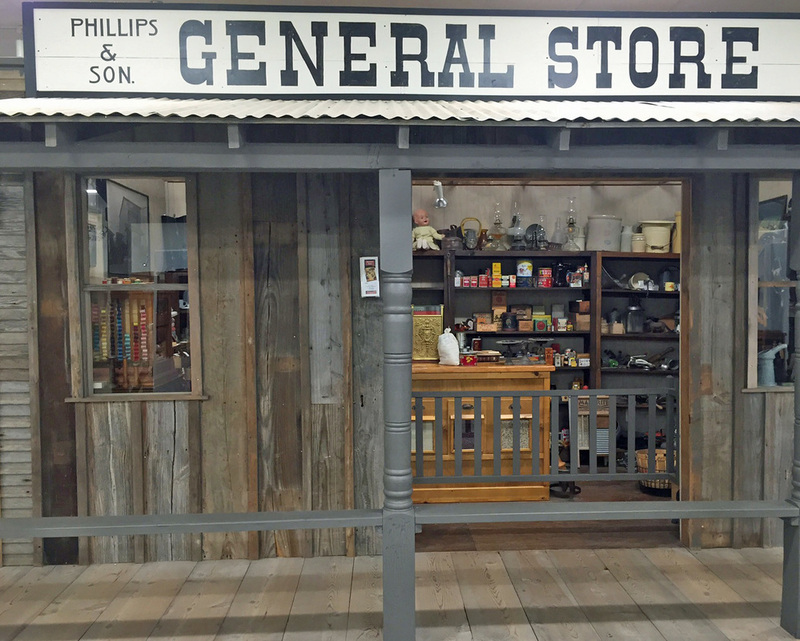 1900's street scene allows a view of life on the High Plains over 100 years ago. General Store stocked with all the necessities and niceties available to early area residents. 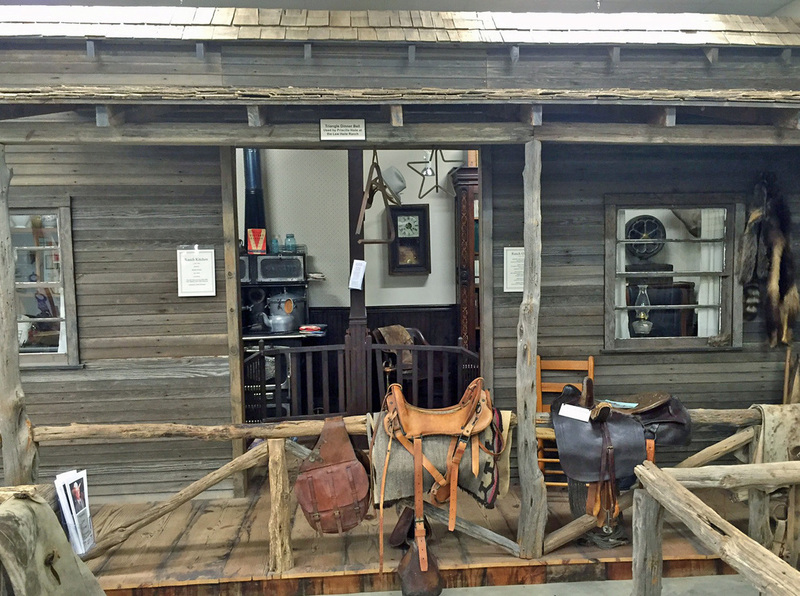 Ranching was one of the early occupations for Moore County. 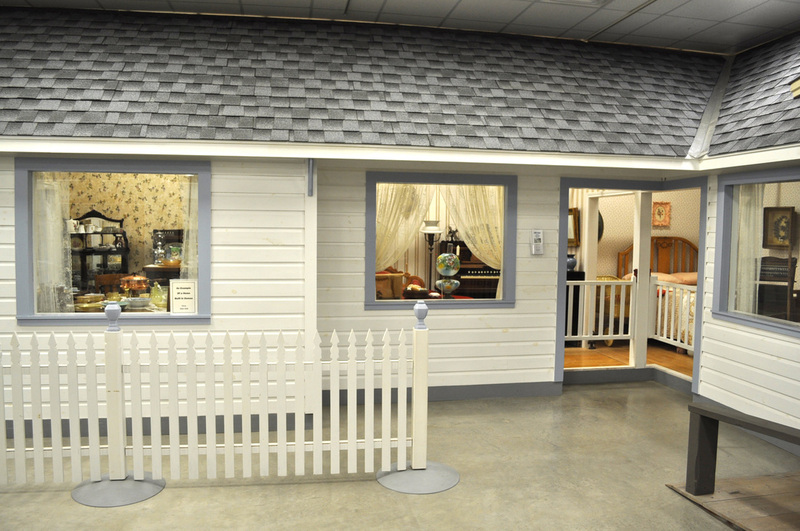 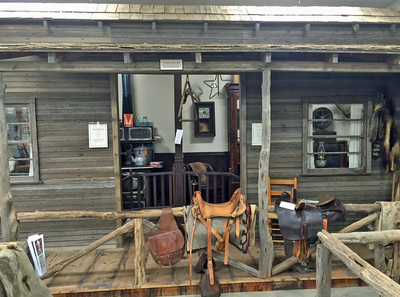 This replica of a typical rancher's home was constructed of wood from a barn that was 100 years old. 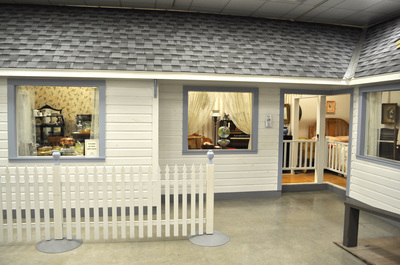 Most 1920s to 1930s homes were small, usually, just four or five rooms. 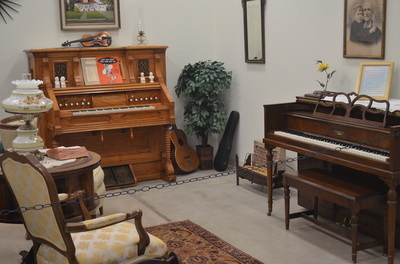 This home has a dining room, parlor, and bedroom. 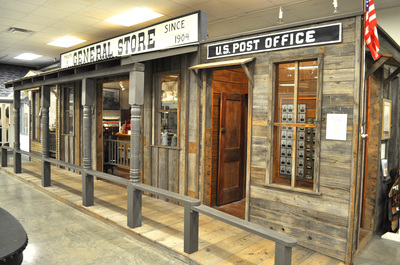 Many years of experience by a master carpenter helped design this replica. 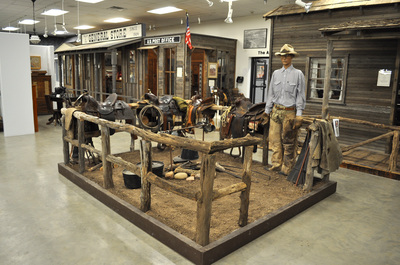 Cowboys in a typical branding scene features Marshall Cator, a pioneer rancher in the Panhandle area. 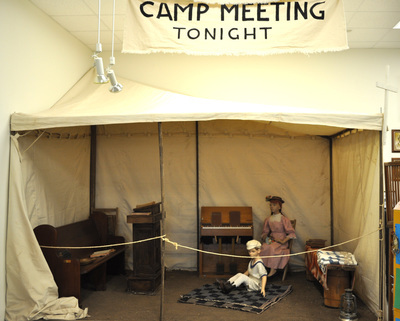 Churches were few--camp meetings were community wide social events with picnic lunches and overnight camping. 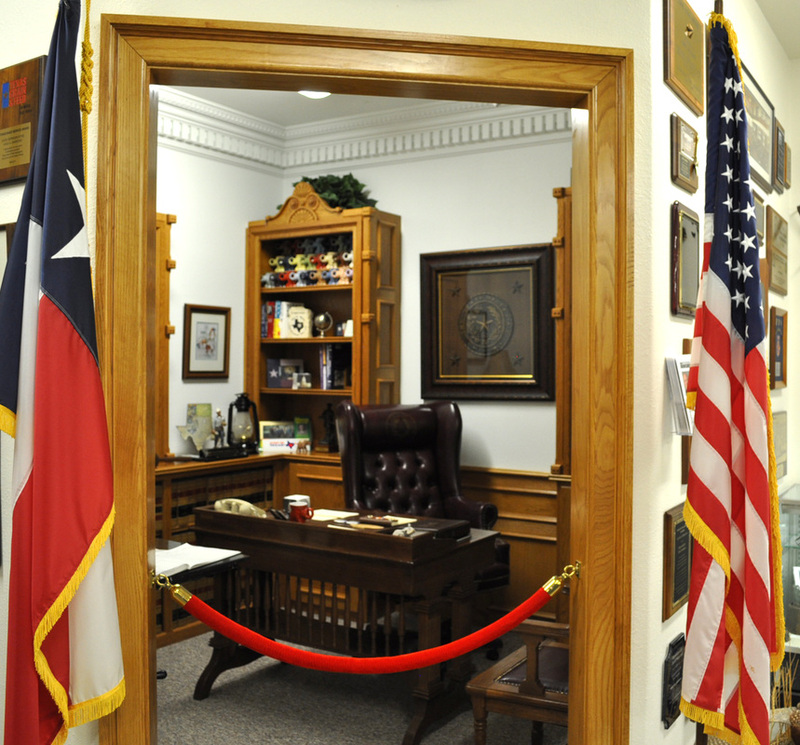 Tile cartouche on the wall was used in the 1930's to decorate the district judge's office, light is from the early courthouse. Artifacts from the Plains area Indians, alibates flint was used for tools, spears and arrowheads. 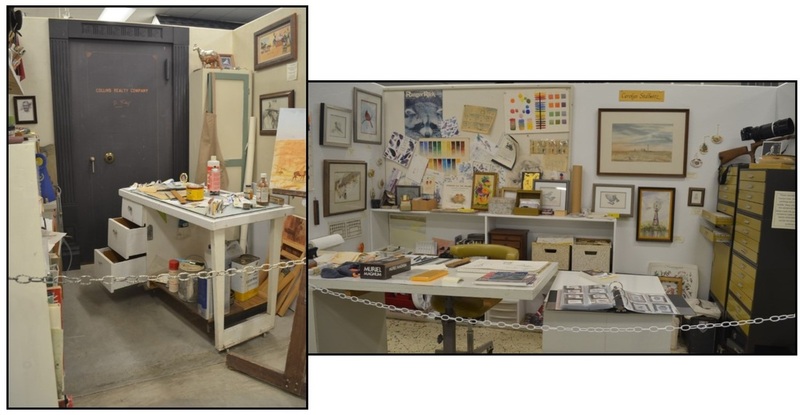 Replicas of studios of two area artists...Don Ray of Channing and Carolyn Stallwitz of Dumas. 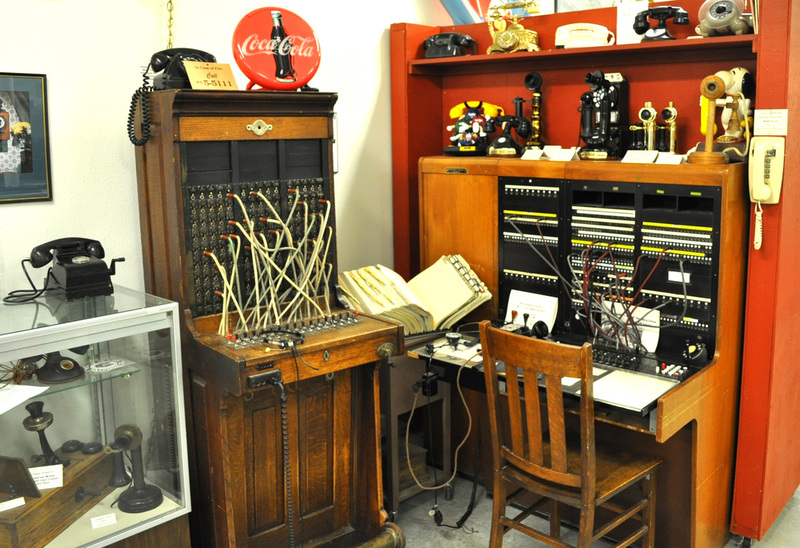 Telephone services came to Dumas in 1928 with 44 phones in service. 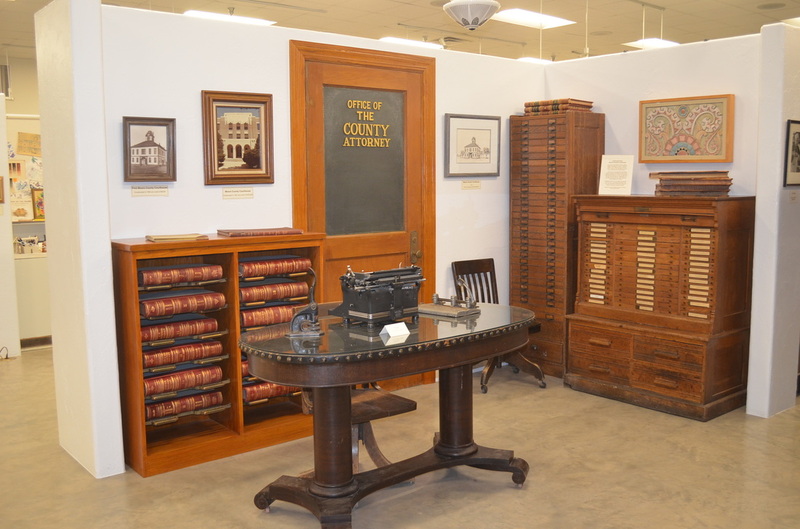 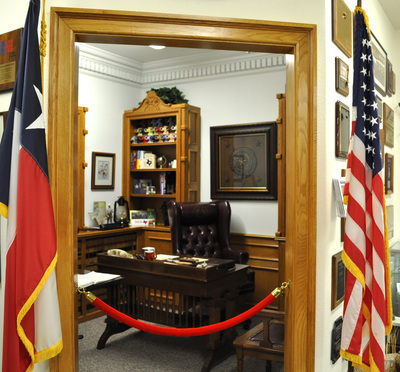 A replica of the Austin office of David Swinford of Dumas who served as State Representative from 1991 to 2010. Toy tractors are part of a collection of a local farmer who has collected them since he was a child. Shamrock Oil and Gas began in Moore County in July of 1936. 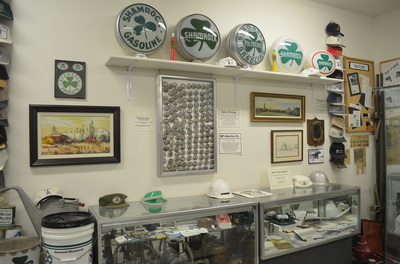 Today, the Valero McKee Plant is one of the county's largest employers. 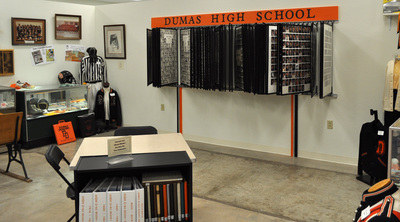 Photos of graduating seniors from 1929 to 1997 center the display of Dumas High School artifacts. 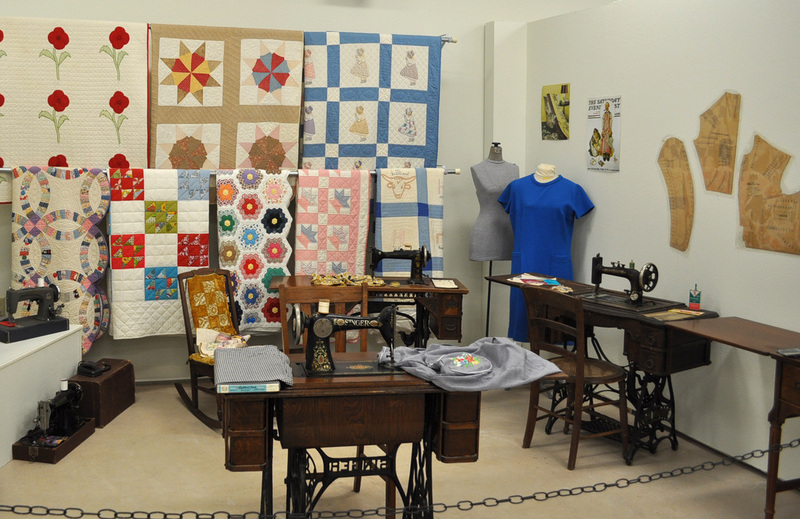 A display of quilts, some from the mid 1800's, decorate the wall of a sewing exhibit. A mural, painted by Joye Watson, covers the wall behind a playa lake in the wildlife area. Forms of entertainment, from musical instruments to record players to television sets, fill this area. 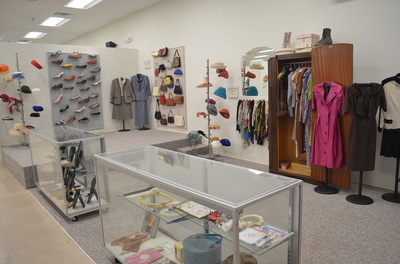 Shoes, purses, clothing, hats and other accessories are displayed in the textile area. 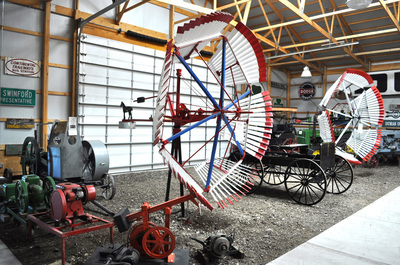 After horses came buggies for transportation. 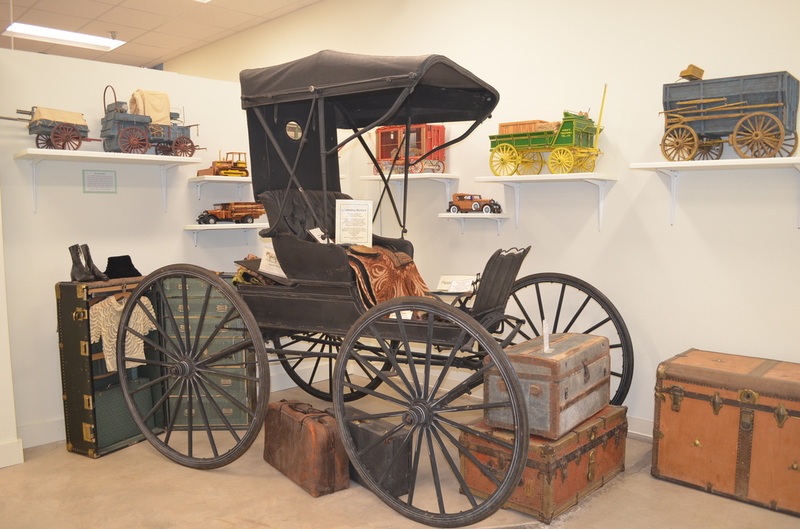 This buggy served a local doctor during the 1800's. 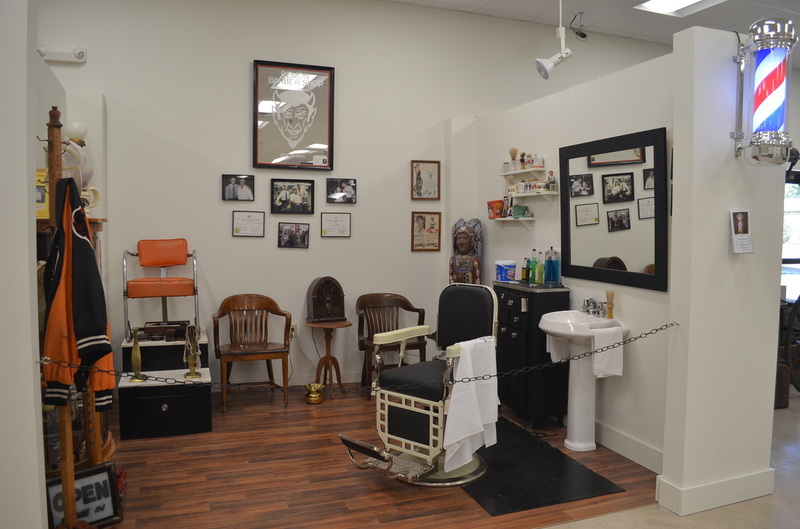 Barbers served communities in many ways. 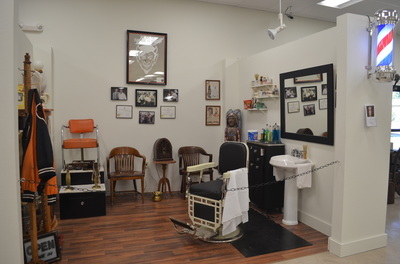 They not only gave haircuts and shaves, but sometimes acted as doctors and dentists. Preparing meals for families took much more time that it does today. 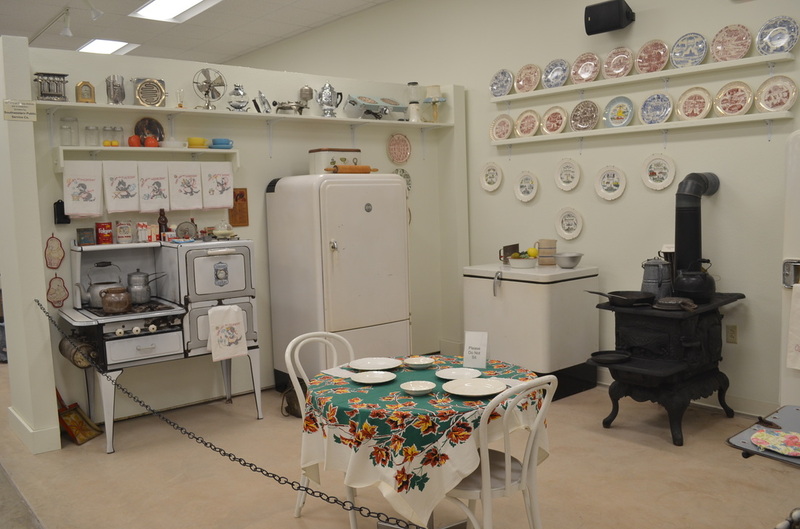 Households progressed from wood to gas ranges and from "ice" boxes to propane, then electric, refrigerators. 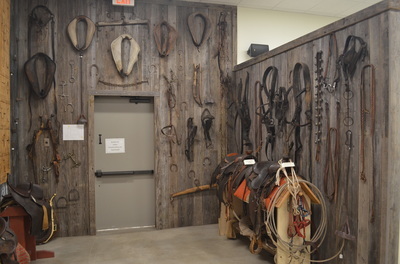 Tach rooms were important for storing saddles, bridles, reins, and other horse-related equipment. 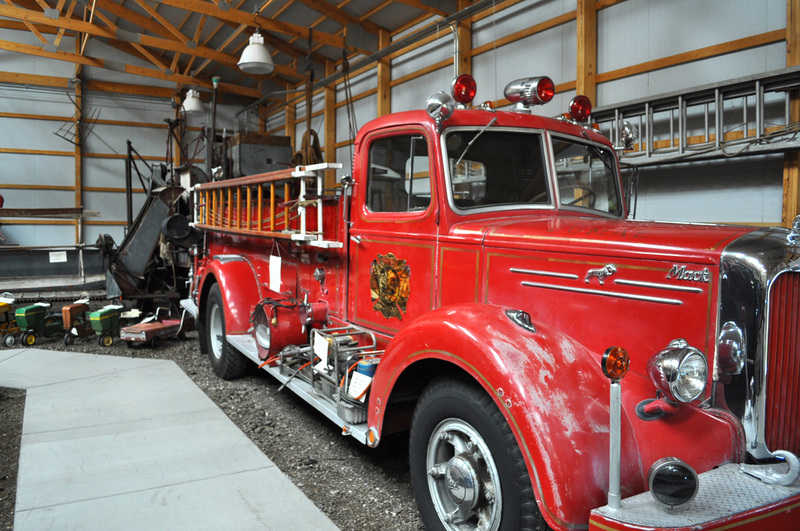 This 1951 Mack fire truck was purchased by the City of Dumas in December of 1951. 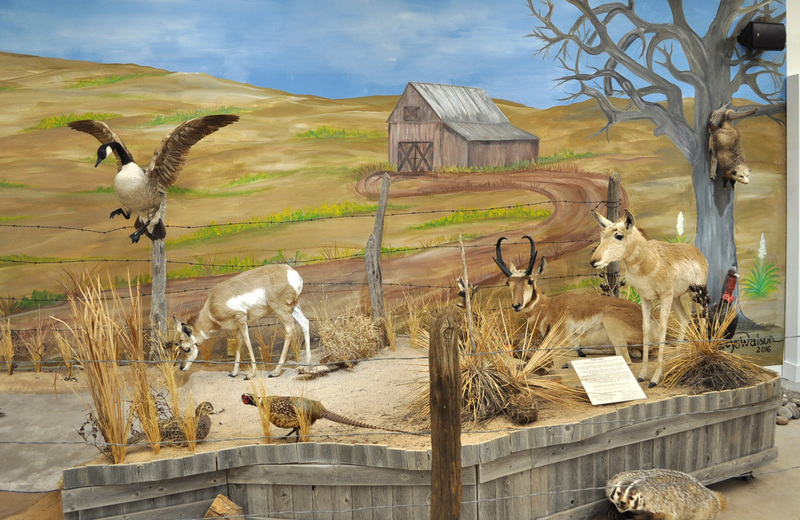 It was purchased by Ray Witt and Wayne Chrisite at an auction, then placed in the museum in 2004. 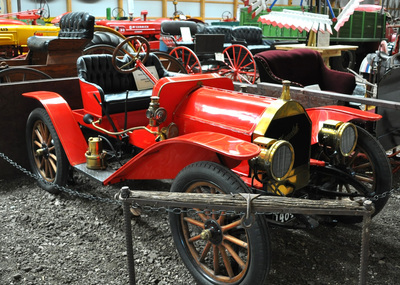 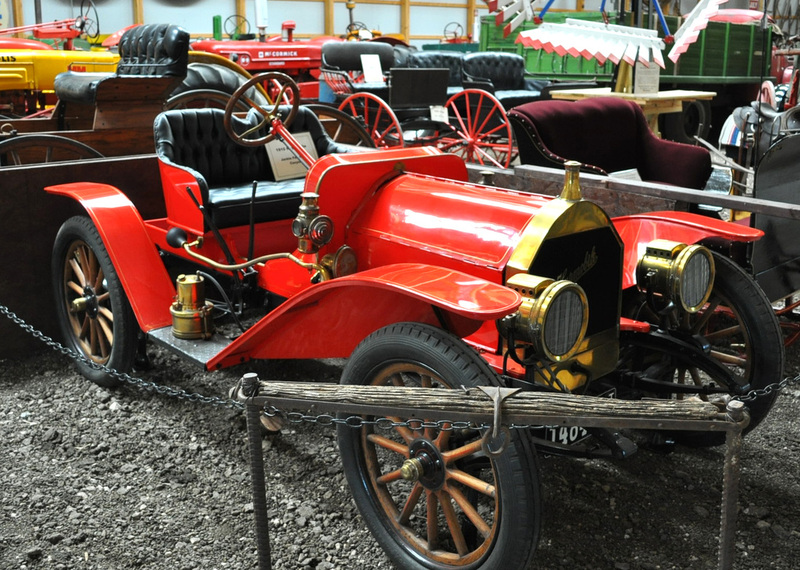 This 1910 Hupmobile was used in East Texas as a mail delivery vehicle prior to World War II. 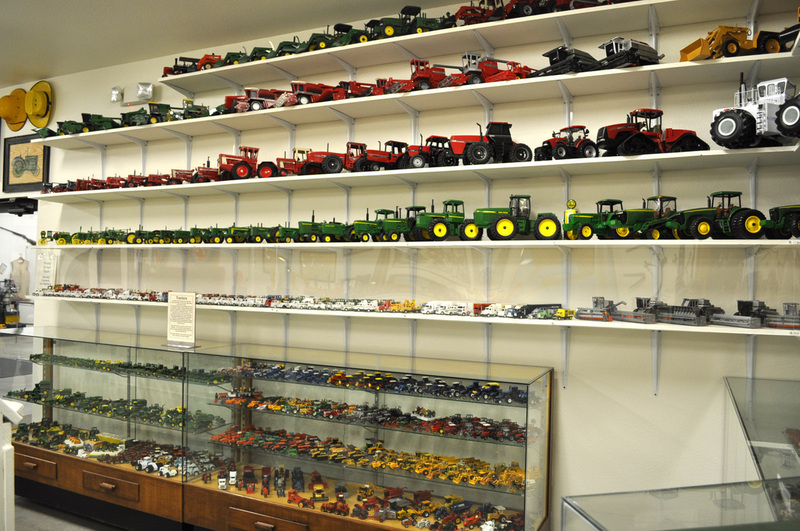 Tractors, tractors, tractors line one wall of the machinery building. 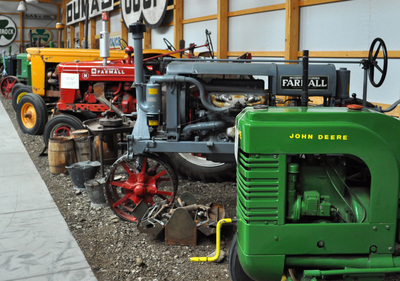 From John Deere to Case to Minneapolis Moline to International to Oliver to McCormick Deering to McCormick Farmall - all kinds. 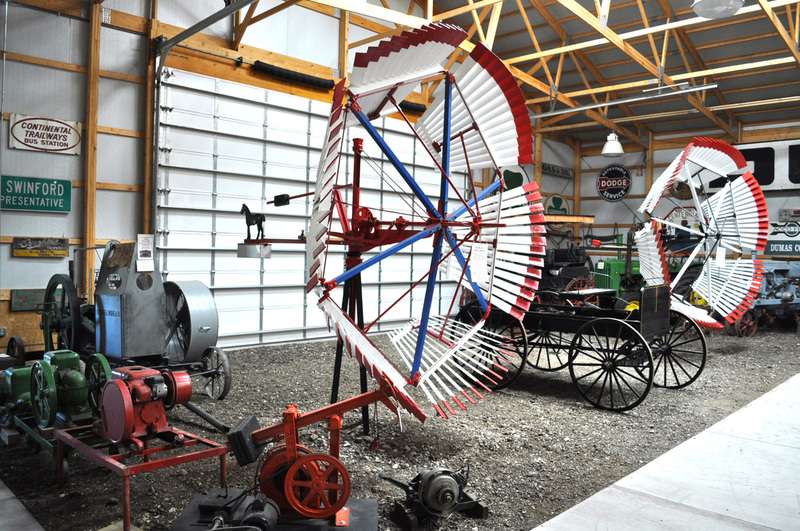 Three wooden windmills, an Elgin No. 2, a Dempster No. 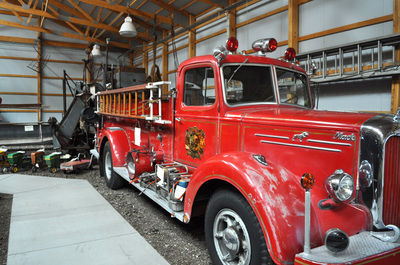 3 and a Pipe Raymond, were methods of pumping water in years past.